So a few weeks back I undertook a 2 week placement in a Catholic Primary school in my local area. I was placed in a Prep/One composite class. The school is a medium size school with both male and female students. Is your husband a Farmer? You are probably wondering about questions 3 and 4. Well on placement the students are encouraged to call us Mr/Miss/Mrs depending on your marital status and preference. So I walk into school as Mrs Farmer. Still not 100% used to this surname as it isn’t my original surname. This means that I was also totally unprepared for these questions. After getting the farm questions out of the way I spend the first few days mainly taking observations of my mentor teacher, do yard duty, go to meetings, and take small groups for some reading and maths groups. The 2nd week was full steam ahead. My mentor teacher went with the sink or swim approach. She gave me the weekly literacy focus for the class and said you can take the literacy lessons for all of next week. Literacy was never my strong point at school. I was a numbers and sports kind of kid. I especially did not really appreciate Poetry. Lucky for me the literacy focus for writing the week of my teaching was…. wait for it…. POETRY! I had to plan about 5 or so lessons based around poetry. Thanks to the internet and pinterest I managed to piece together a bit of a poetry introduction and progression to a few different types of poetry. Pretty clever for a bunch of 6 and 7 year olds. So all the students were sent back to their desk to do a rough draft of their acrostic poem. once it was checked they then got a cloud to cut out and write their name in and a few coloured strips to write their describing words on. Once they were finished we hung them up in the class room. This is what the final product looked like. The students really enjoyed making these. Most of the prep students didn’t finish but I had a few students go home and get their older siblings and parents to help them with making acrostic poems. The biggest learning point when I was there was all about classroom management The biggest working strategy in the school was the teacher would say “1, 2, 3 eyes on me” with the students then responding with “1, 2, eyes on you”. Well I did have to say it.. A LOT actually. I remember the first time I said it I was thinking in my head.. wow I sound like a total fool, but after a while I got used to it and it actually worked. Probably the most successfully out of all the strategies that my mentor teacher had used. I learnt so much from this placement. I was really lucky to have a great mentor teacher. Sink and swim method definitely helped me. 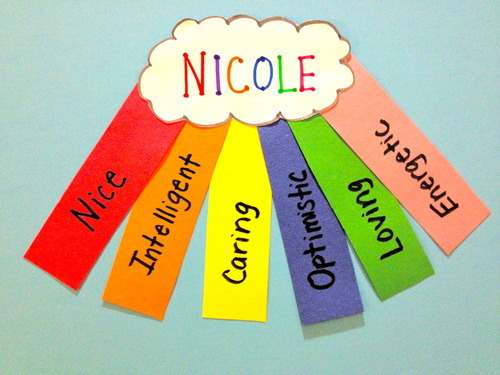 This entry was posted in My Learning and tagged acrostic poems, clouds, colourful, literacy, one, Placement, poetry, Prep, School, Teaching, writing. Bookmark the permalink.